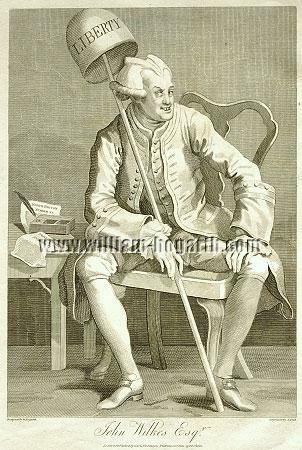 John Wilkes Esqr. 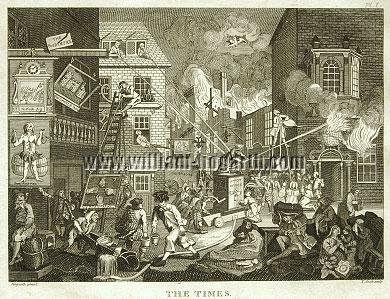 (editor of the North Briton Journal) & The Times or The Political Blaze caused by the Unlawful “General Warrant against Writers, Printers, and Vendors” of the North Briton. 3 sheet. Engravings, 2 of them by Thomas Cook (c. 1744 – London 1818). Inscribed (2). 13⅞ × 9⅝ and 9⅝-6⅛ × 12⅜-12⅝ in (35.3 × 24.5 and 24.5-25.5 × 31.5-32 cm) resp. and this still after 130 years !) . The sitting portrait shows him, little flattering, but true, in determined position with the hat of freedom on top of a long pole. On the little table at his side the notorious No. 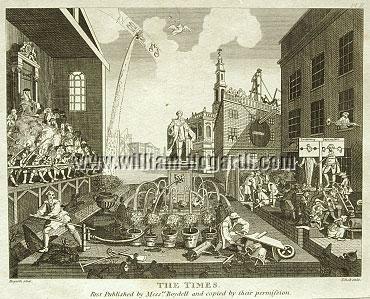 45 of the paper tearing to rags the King’s Speech of George III, and the 17th issue in which Wilkes criticized the 1st sheet of Hogarth’s Times. The 2-sheet TIMES set in this context . 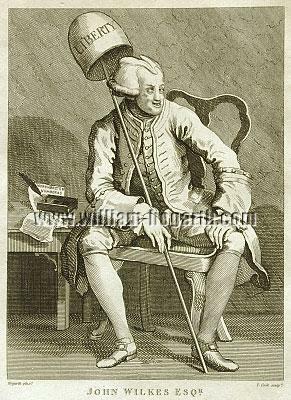 “ Really Frederick (II of Prussia) got into worst crisis by the policy of the new English government under George III and Lord Bute: because England had obtained in overseas what it wanted it needed Frederick’s no longer. Bute even intended to come to terms with Austria at the expense of Prussia. So Frederick dispensed with further English support; nevertheless he collected an army of 120,000 men for 1762. (Orthbandt, Deutsche Geschichte, 1954, pp. 603 f.). 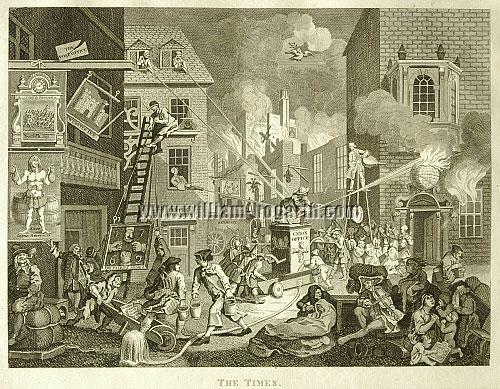 Quite above in the left dormer-window as the quarters of the poor yellow press possibly Wilkes himself with a fire-hose directed against the Pitt successor Count Bute as the royal fireman. One of the most concentrated charges by the artist. to the European-German , together global , event of the century . (Frederick II to his favourite sister Henriette, margravine of Bayreuth). 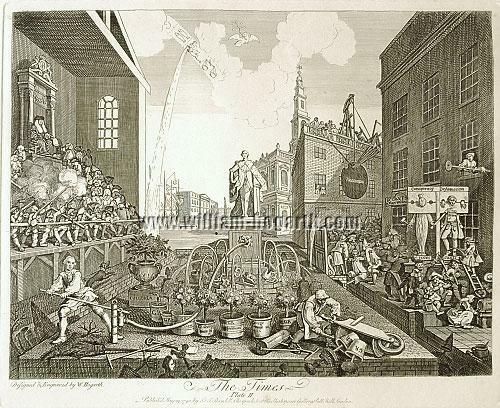 The two Cook versions – in the original format as in none of the later Hogarth editions – in very fine impressions of inevitably wonderful chiaroscuro in TIMES I. The background hatching of the Wilkes portrait illustrating that he is behind bars. The first below, the latter on the left trimmed within the platemark. TIMES I slightly marginally foxing. Its backside certain foxing not showing through into the picture. – – – The same in Cook’s smaller version of 1809. Subject size 7 × 5¼ and 5⅞ × 7⅜-7½ in (17.7 × 13.4 and 15 × 18.7-19.2 cm resp. – Trimmed within the wide white platemark and here in the outer part time-stained. – – – The same in steel engraving. C. 1840. 6⅜ × 4¼ and 4⅞ × 6⅛ in (16.2 × 10.8 and 12.5 × 15.5 cm) resp.